Zazzle is a great starting block for graphic designers and artists. You get to put your designs on templates of products for free and if anyone buys those products you get 10% commission. You can upload photos or you can use computer packages such as Illustrator or Photoshop. 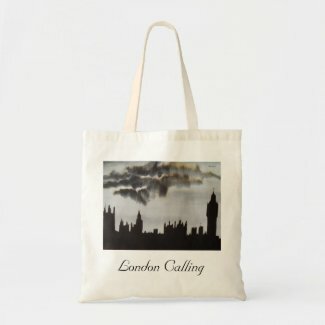 For my first series of Zazzle entries I used an ink and bleach painting of The Houses of Parliament in London. I was able to upload the image onto a wide variety of products and luckily with time a number of my items have sold. Zazzle is however only a starting point. You don’t make money quickly it requires lots of hard work, especially to begin with and very few make enough to pay the mortgage. It is however a great stepping stone. You learn what is popular, what sells and therefore where to concentrate your energies when you want to take a riskier route putting down your cash. Often it is hard to see if a design really works on a particular product until you have a product template. Zazzle allows you not only to try your design on many products but also on some of the products, including tshirts, you can change the color. You also own the copyright to your design so you can try a number of other sites such as cafe press with the same designs. There is also a forum which allows you to ask lots of questions of other Zazzlers. A key to Zazzle success is promotion, lots of people use blogs, twitter, facebook and pinterest, which are a good idea to look into anyway, if you want to get your business of the ground. The key is to be original but also keeping to popular themes, your products must be searchable. There are whole blogs on SEN, which is worth looking into for Zazzle specifically. Hey, nice blog. I used to use Zazzle too and now have my own stall in our town centre – Zazzle really helped me decide what T-Shirts worked (even if they did not sell a lot of views meant I produced some T-Shirts myself. Have you used eBay? At the moment I don’t but might. Good luck! Congrats on the market stall, that’s something I’m thinking about. Have tried ebay, but only put up one tshirt and also put it up mid week that one didn’t sell. Next time I will try a Sunday evening which is supposed to be a good time. Good luck with everything!! My fist sale didn’t take long but I did know the person. It took around four months to sell to a complete stranger. If your using Zazzle to assess what is likely to sell and then sell elsewhere, then it’s worth sending a link to your shop to the friends you most trust the judgement of, I would say AT LEAST 10 and get their opinions. It does take a while to build up a portfolio of products though and the more you have the more you are likely to sell. Good luck!